Those of you who know Greg will confirm he isn’t the most patient of people but, when on the first night of a two night staycation, he asks to speak to the duty manager it means he’s really pissed off. There wasn’t a major incident that lead to him doing this, just a series of inconsistencies and frustrations that really shouldn’t happen when staying in a hotel by such a well-regarded brand as Accor. Due to the Islamic New Year we had a long weekend and decided to head into Cairo for a couple of nights. 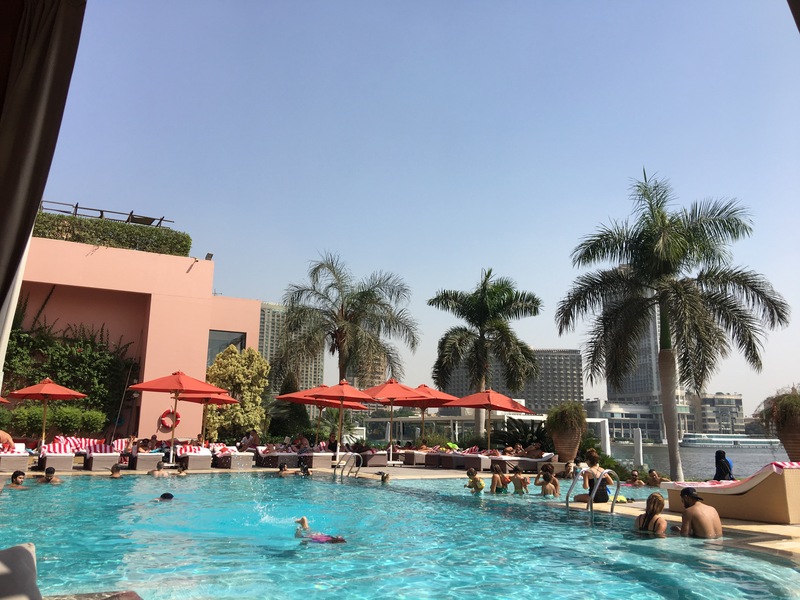 I chose the Sofitel, Cairo due to its location right on the Nile, the fact it was ‘buy a night get one free’ using an Entertainer but mainly because we’ve previously had such a good time at the Sofitel Abu Dhabi, Sofitel Palm Dubai and the Mercure Bloomsbury. London which is part of the same hotel group. Booking was very efficient, I made an enquiry through the Entertainer app and received a quote of $303 for 1 night in a luxury club room. 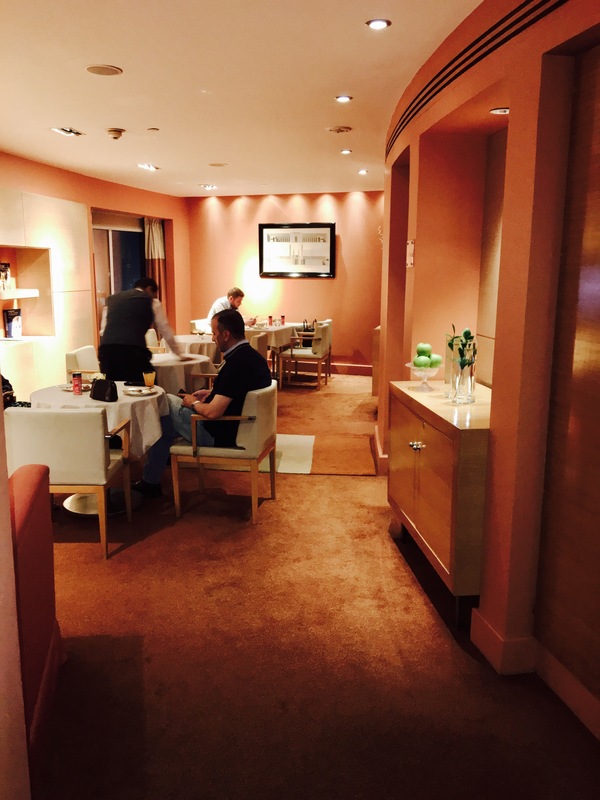 Although I felt this price was pretty high I believed it would be value for money as the food in Sofitel club lounges is usually excellent and the general ‘Sofitel experience’ is good. Due to crazy Cairo traffic we were late arriving and on our confirmation email it said to call or our room may not be held. We rung a few times but nobody answered, luckily when we arrived our room was still available. We were checked in at the Club Lounge on floor 16 and we decided to stay here for drinks and a snack before going to our room. 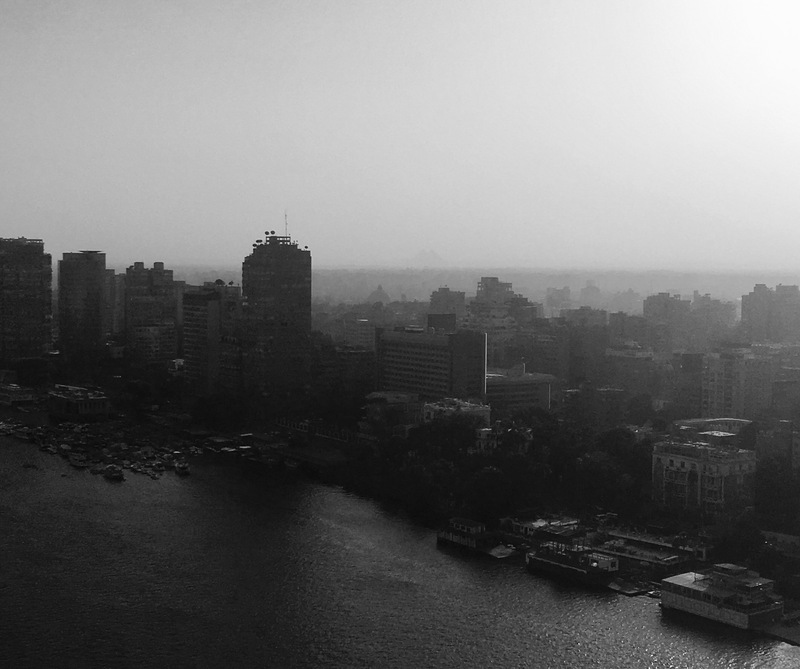 ​Located at the southern tip of Zamalek in downtown Cairo, the views from the lounge are impressive. 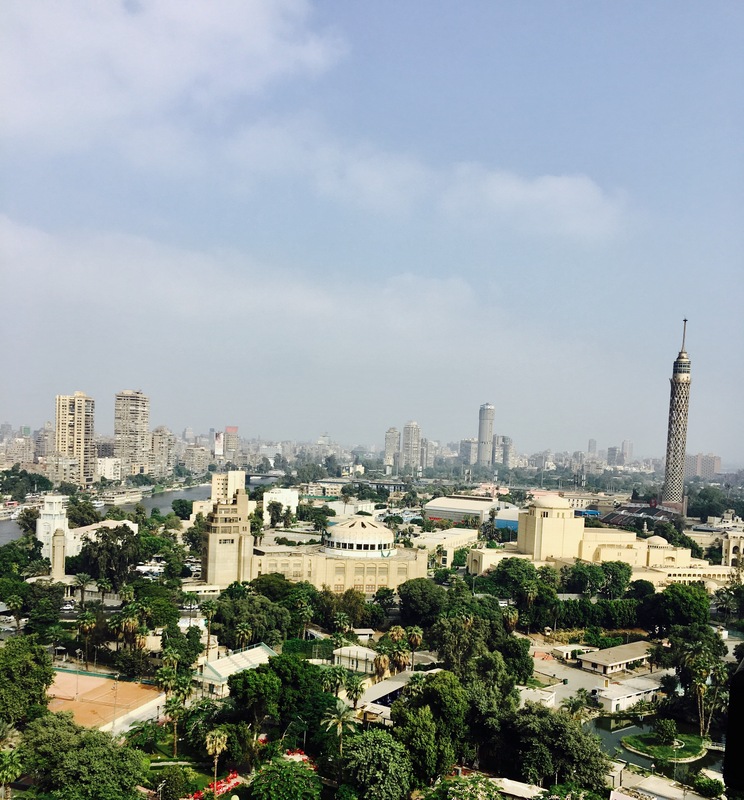 To one side the sprawling city is clearly visible and, to the other, Cairo tower dominates the skyline. We felt the club lounge wasn’t as relaxing as other lounges I have been in, it definitely lacked comfort and atmosphere. The colours were very harsh and the table and chair set up felt too formal and not very ‘loungey’. The staff however were friendly and welcoming but they didn’t try to chat or engage with us as they were often behind the desk on their mobile phones. As we only had an hour left to make use of the complimentary drinks and food we ordered a beer and whiskey and went to get snacks. Unlike other club lounges the food offering was quite limited. 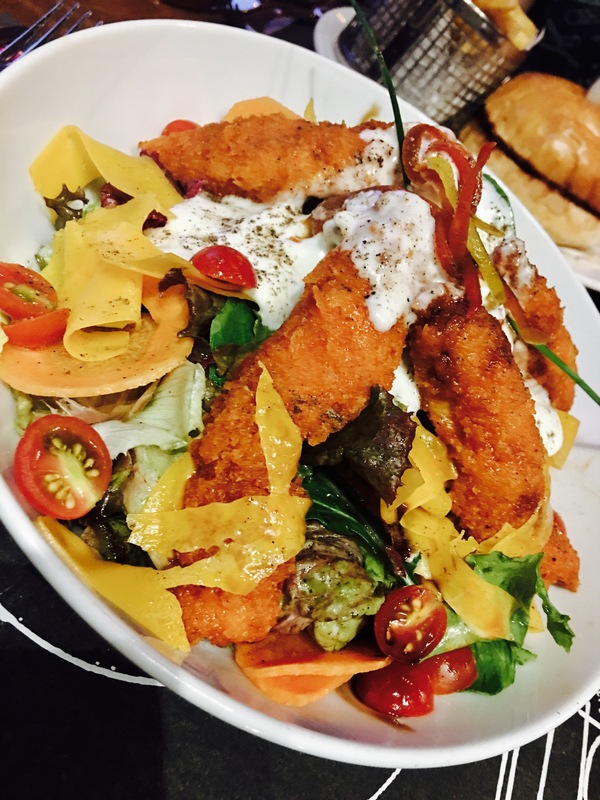 For hot food there were thinly sliced chicken fillets and fish goujons but nothing to accompany them such as veg, rice, breads or salads. There were also some sandwiches which were a little dry. Those with a sweet tooth fared better with a selection of cakes, tasty donuts, dried fruits and nuts. After a couple of drinks and feeling a bit underwhelmed, we headed to our luxury club room on the 24th floor. 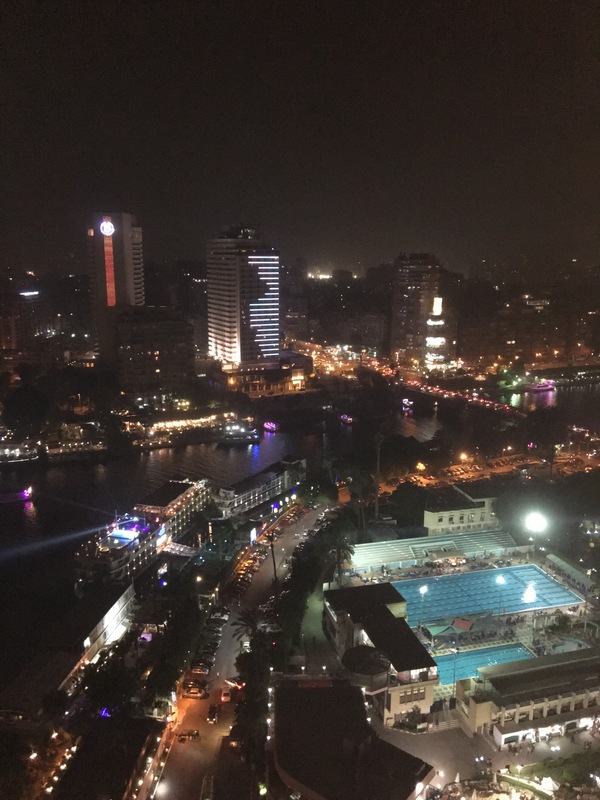 The view from our balcony was fantastic, we could see right across the Nile and over the city. The luxury room was comfortable in fact it was quite spacious with a large bed, chaise lounge and a small desk. We’d been left a handwritten note with a welcome tray with tasty sweet treats and a small banana milkshake. The bathroom, despite being compact, was very clean and although there was no separate shower the rainfall shower head over the bath looked great. We also had robes and slippers. Next to the bed was a pillow menu and a choice of scents for the turn down service. We rung the club lounge to ask for fresh milk as they only had powdered milk which is disgusting in tea. We rung a couple of times but there was no answer, so in the end we called room service and within minutes a jug of fresh milk was delivered to our room. After a lovely cup of tea taking in the view from our balcony we slept soundly. The room was very quiet and the bed was so comfortable it was hard to get up the next morning! Unfortunately when we woke it was a little hazy and we couldn’t see the pyramids from our room, so we went for breakfast hoping the sun would burn off the haze. 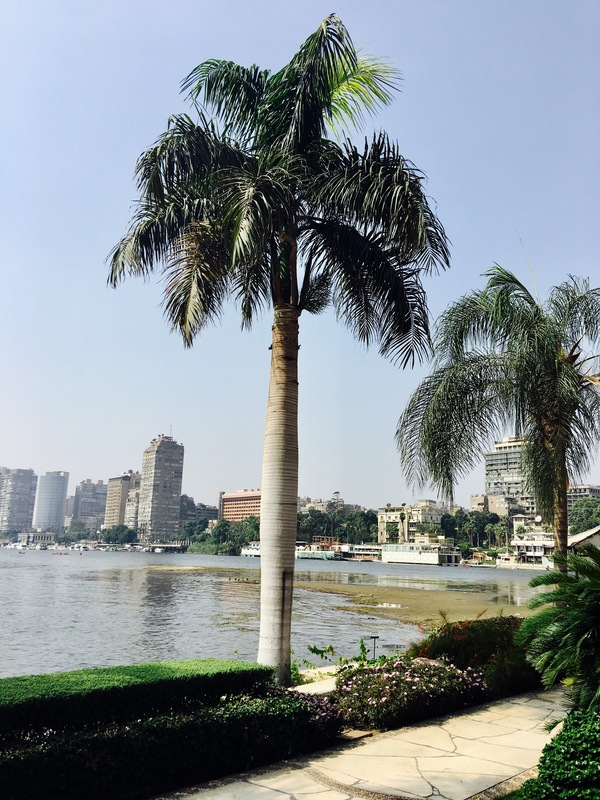 We decided to have breakfast buffet in the main restaurant which has a lovely view over the Nile and the hotel gardens. We gave our room number and we were offered a table inside or on the terrace, we opted for inside. I was surprised we weren’t shown to a table, simply pointed in the direction of the dining room. It’s was quite difficult to know which tables were occupied so after a couple of circuits of the room we ended up asking which table was free. We ordered tea with cold milk and headed off to check out the buffet offering. There was quite a good selection from cold meats and cheeses, fresh fruit and yoghurt, cereals, pastries, hot items such as mushrooms and sausages, GF and organic options plus a live station cooking eggs. 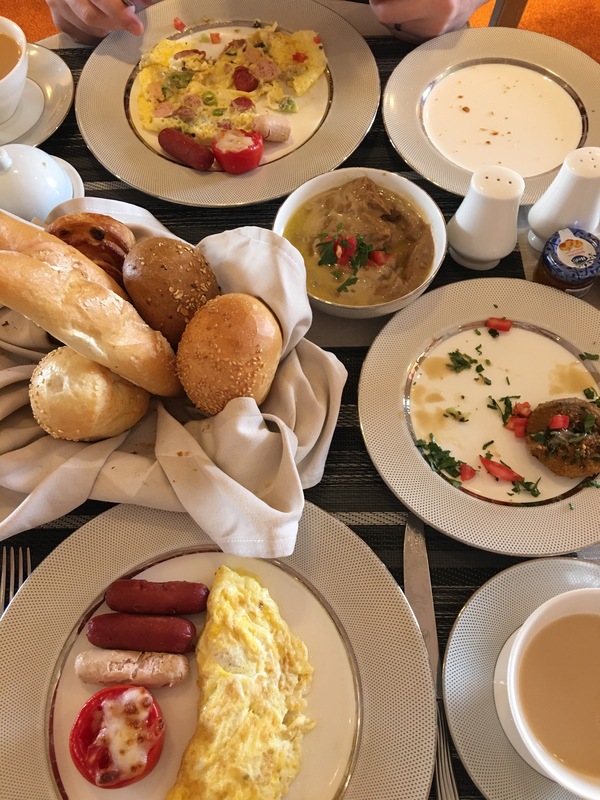 ​Greg ordered an omelette with everything except chili and I ordered my favourite Arabic dish – shakshuka. I was encouraged by one of the staff to try some of the Egyptian dishes such as ful medames and I agreed, unfortunately despite waiting the dishes never appeared. When we got to our table we’d been given hot milk and Greg’s omelette was full of chili. My shakshuka didn’t resemble any shakshuka I’d had before, it was much more like scrambled egg. It was pretty disappointing and was left uneaten. Maybe Egyptian shakshuka is different?! 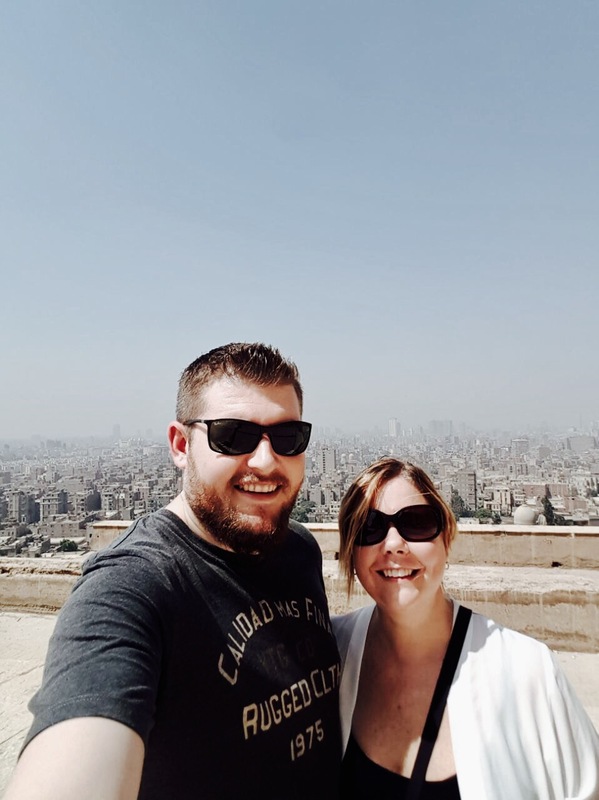 After a rather lackluster breakfast we headed to our room (we still couldn’t see the pyramids) and got ready for our morning trip to Muhammad Ali Mosque which is definitely worth a visit. It is such an interesting place with incredible views and only a 15 minute taxi ride from the hotel. On returning to our room we found that it had been made up, but the table I’d left pulled out and away from the wall so the tea and coffee stains could be removed, had simply been pushed back and the stains still there! The room still didn’t have Lanvin products as specified in the room information. 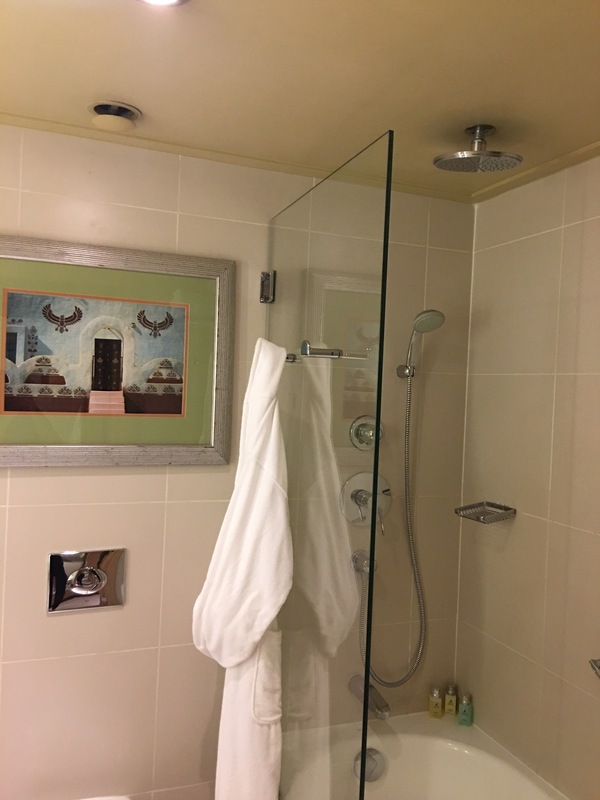 The rainfall shower flooded the floor as the shower screen didn’t provide enough cover and, as the hairdryer was hard-wired into the bathroom, I couldn’t use it as the bathroom was so damp. I think after paying a $400 deposit a regular, stand alone hairdryer isn’t too much to ask for! We decided to relax by spending a couple of hours by the pool and when we arrived at midday there were no umbrellas available. The friendly member of staff set up a small cabana for us and said that once an umbrella became free we could move. Unfortunately he didn’t communicate this to his colleagues as shortly afterwards other people were given loungers and umbrellas before us! 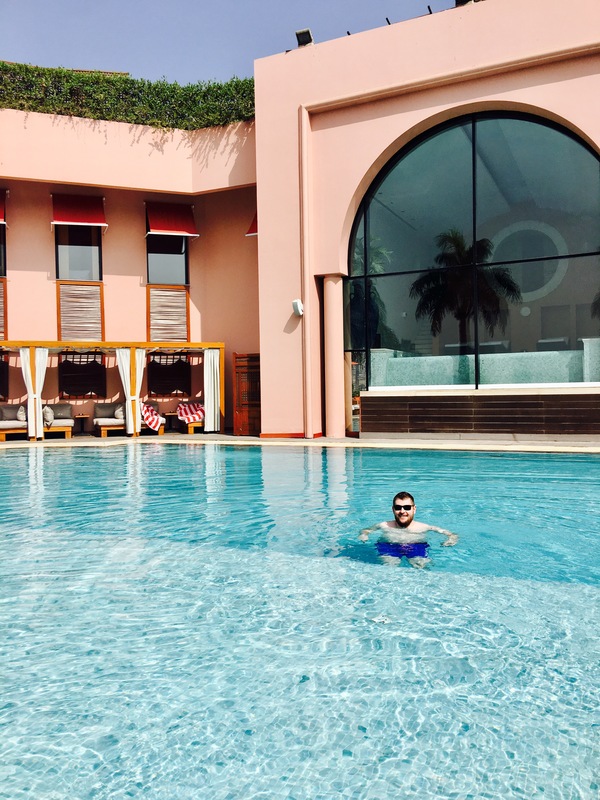 Not to worry, the cabana was comfortable and the views from the pool across the Nile were stunning. The pool area isn’t very large but the temperature of the water and the design of the pool was good. Feeling a little peckish we decided to order lunch. Greg really enjoyed his club sandwich but my Caesar salad was not very good. The lettuce had been almost shredded and bound in a thick mayonnaise rather than garlic. It was also missing anchovies which were listed on the menu, I didn’t eat much of it. Having spent a few hours by the pool we went back to our room to get ready for the evening. 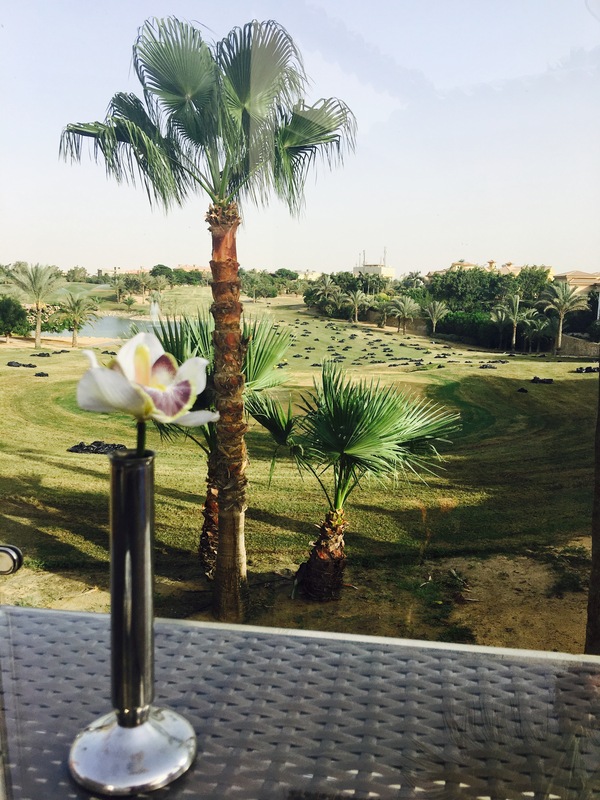 I was so happy to see a very faint outline of the pyramids from our room ………if I squinted really hard! Again we rung for fresh milk and tea bags as they hadn’t been replaced when our room was made up. 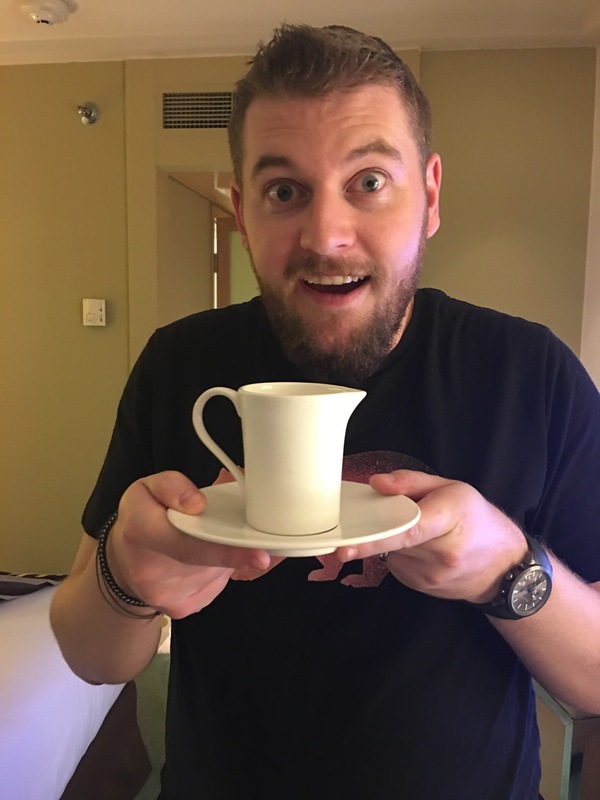 We called room service as we had the night before and I asked for 2 tea bags and a small jug of fresh milk. A few minutes later room service arrived with a pot of tea for 2, hot milk and a large glass of cold milk ……and a bill. I explained this was not what we’d asked for and he told me my problem was that we’d called room service not housekeeping. We politely explained back we only did what we had done the night before with no problems. He was very nice about it but clearly there was a communication issue. We then went to get a shower to discover our toiletries (still not Lanvin) had not been replaced. Sigh. We went up for drinks to the club lounge and again we were disappointed with the food on offer. I *think* there were small chicken drumsticks and maybe small lamb skewers plus the same sparse selection of sandwiches, pastries and fruit. This is definitely not consistent with other Sofitel club lounges where the food is more substantial. They did serve a very generous whiskey however! ​As we were still hungry we decided to go to Kebabgy, the oriental restaurant in the hotel. 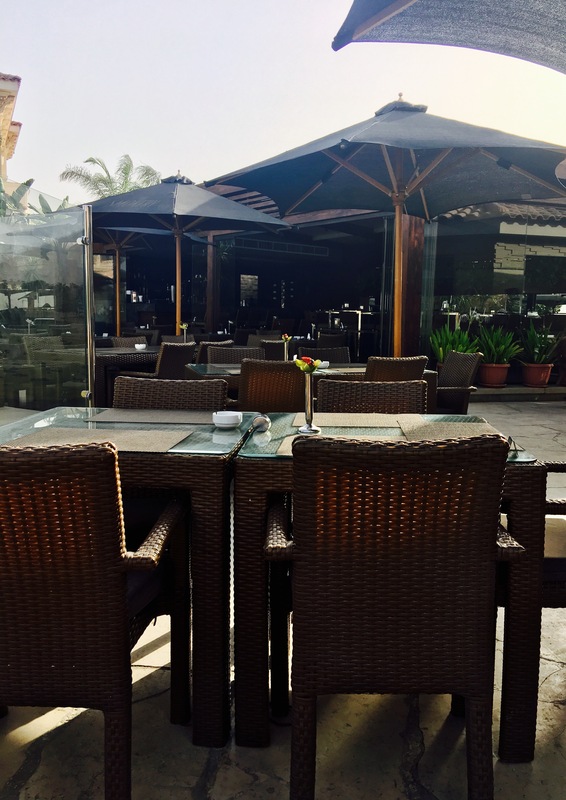 I’m not going to go to lots of detail other than to say the location was very nice, the restaurant well styled and the food, although tasty, was not very filling as the portion sizes were small. 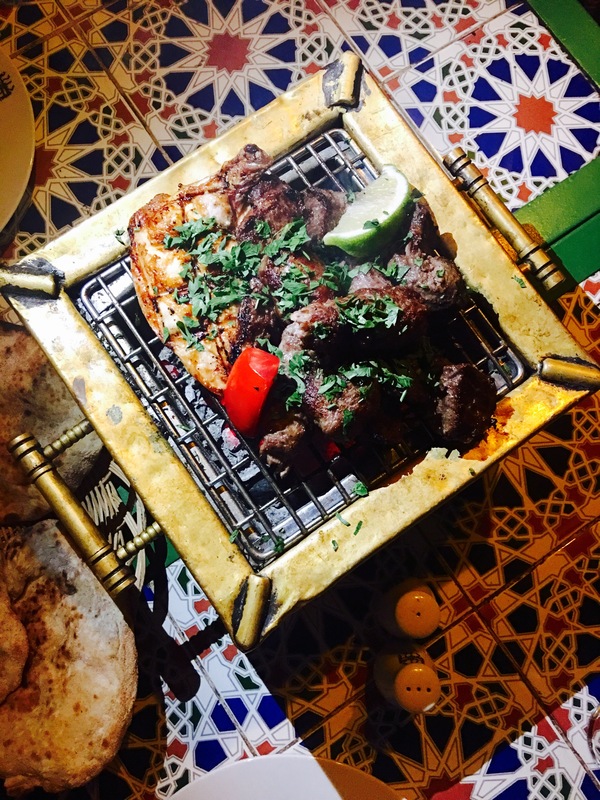 The photo is of the mixed grill for 1 person and 1 serving of shish kebab both served together. Whilst having dinner we were chatting about the hotel and I brought up the hotel website to check out the rooms on offer. It was then I read we were meant to have access to a butler – this was the first we’d heard about it! Also, I couldn’t find a price for a luxury club room anywhere near the $300 we’d been charged either on the Sofitel website or comparison sites……..maybe the holiday had hugely increased the cost of a room? On the way back to our room we decided to stop by reception and ask for a late check out the following day. The receptionist told us we should ask our butler – we told him we knew nothing about a butler this as we hadn’t been told. about this service. He said we should have been calling our butler if we needed anything during our stay! On return to our room we found we hadn’t had a turn down service (again) and had no fresh towels, toiletries or water. We rung the butler twice – he didn’t answer. We rung reception and we were cut off. We rung again and Greg, whilst trying to explain, was constantly interrupted. It was at this point Greg went to speak to the duty manager. He listened to Greg’s concerns and agreed these issues were not portraying the hotel in a good light. He assured us the manager would be notified about our concerns when he was back at work on Sunday. At 11pm that evening we received teabags, towels and toiletries! The next morning we went to the club lounge for breakfast. There was a small buffet and items could also be chosen from the a la carte menu. Greg ordered a pepper omelette and a side of veal sausage, I ordered cheese omelette with sautéed potato and veal sausage. What we got wasn’t quite what we asked for – Greg got a mushroom, sausage and chili omelette with turkey and veal sausages on the side. I received a cheese omelette with veal and turkey sausage. I never received the potatoes. We were the only table in the lounge, how could they get this mixed up?! By now I was kind of losing the will to live, it was becoming a bit of a farce. The pastry basket was nice. In the hope of getting an umbrella we headed to the pool early. As soon as we arrived Greg ordered a juice, which after 90 minutes still hadn’t arrived. To be honest we weren’t entirely surprised. Again, the pool and views were delightful. We decided to have lunch by the pool and I chose a dish I thought they couldn’t possibly get wrong – Greek salad (I asked for it minus the olives). Greg ordered pizza. I was being far too optimistic. The salad was wrong, very wrong. It was listed as having; cucumber, tomato, onion, red, green and yellow pepper, mint, feta and lemon dressing. What I actually got was; cucumber, tomato and white cheese – not even feta. No mint, no dressing. Oh, actually I also got lettuce which wasnt meant to be included. I did consider only paying 1/3 of the bill as I only received 1/3 of the ingredients but we thought it would be better leaving this until we talked to the manager on Sunday – you know, when we were told he would call. …………………….I left the salad but the birds seemed to enjoy it. By now we were ready to leave. Our supposed ‘stress free relaxing weekend at a 5* hotel’ had turned into 2 days of poor communication, less than average food and numerous inconsistencies. I am so glad we had 241 on this room as even paying $300 for 2 nights (plus food/drinks) was not worth it. 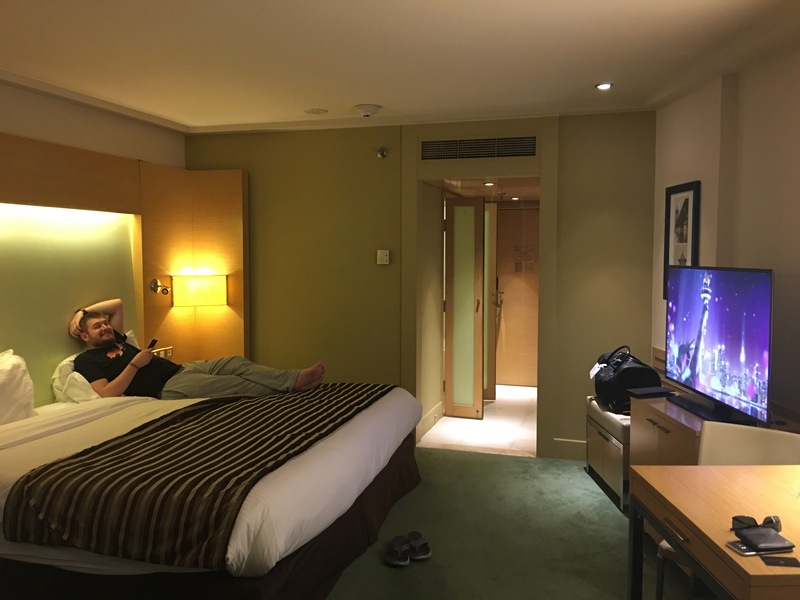 I actually apologized to Greg for booking the Sofitel as it fell well below our expectations. I don’t feel I can recommend this hotel to anyone unless maybe you get a rock bottom price and chose not to eat there. Although the staff were very friendly and apologetic when things went wrong I just don’t feel this was 5* service. I think the final straw was when we were asked on check out how our stay was I explained we’d ‘had some issues’ and we’d spoken to the duty manager. The member of staff just looked really uncomfortable and responded with ‘have a good flight’!!!! On a more positive note I’m a huge fan of the Entertainer. I have saved thousands of £’s using it over the last 3 years. I thought when I left Qatar it would be redundant but no, we can still get 241 stays on hotels worldwide. So, even if you are in a country where you can’t use the Entertainer for services, it’s still worth buying as you can make quite a lot of savings on hotel stays. 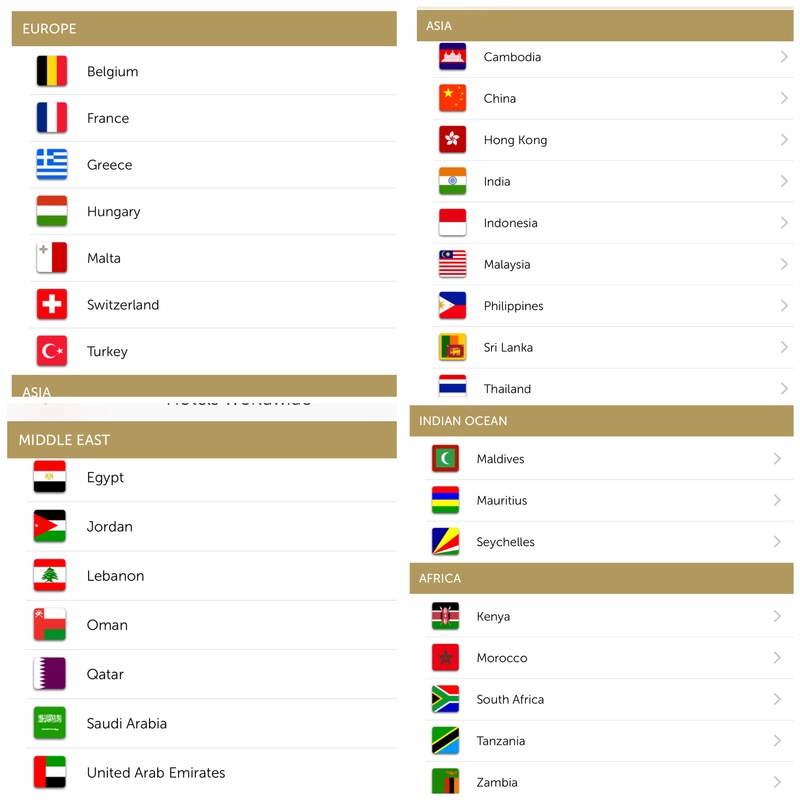 Here’s a screenshot of countries where hotels have signed up to the Entertainer. Any questions please just ask in the comments section below. Having lived in West Bay for 3 years surrounded by bars, cafes and restaurants moving to Rehab has been a big change. I definitely think we’ve made the right choice but I do miss being able to walk across the road to Quickbites or next door to Prime! In a search for a new ‘local’ Greg found The Tap East, marketed as a ‘Neighbourhood Bar’ we thought we’d go and check it out and I reserved a table through their website which was very efficient. It was fairly quiet when we arrived but we immediately felt welcome. 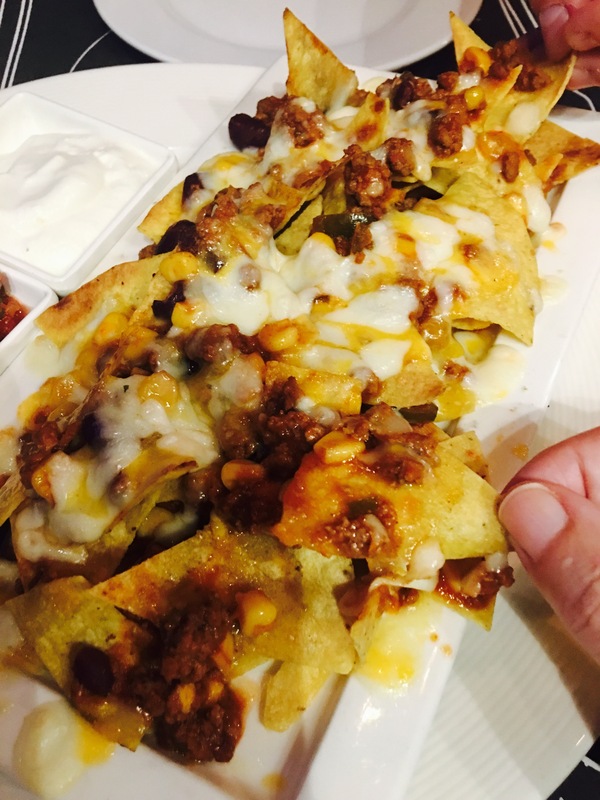 ​We decided to share the nachos as an appetiser and I ordered the buffalo chicken salad for my main with Greg choosing the boneless BBQ rib sandwich along with a couple of bottles of Desparados. As we waited for our food we spent most of the time shazaming the soundtrack which was excellent and create a cool, laid back atmosphere. Mustafa, member of staff, also came over for a quick chat to find out where were from and what we thought of the bar – everyone was really friendly. Soon our nachos arrived and they were a good portion size for sharing. There was a good balance of melted cheese to nacho with a splattering of beef chili and sides of salsa and sour cream. Unfortunately shortly after we started tucking in to them our main courses were brought out. I find this a bit frustrating especially when we specified we wanted an appetiser followed by mains. My buffalo chicken salad was really tasty and just on the right side of spicy for my taste. I did think there was a little too much lettuce but that’s probably because I don’t particularly like it! The salad was nicely presented and the vegetables were crunchy and fresh. Greg really enjoyed his rib sandwich. 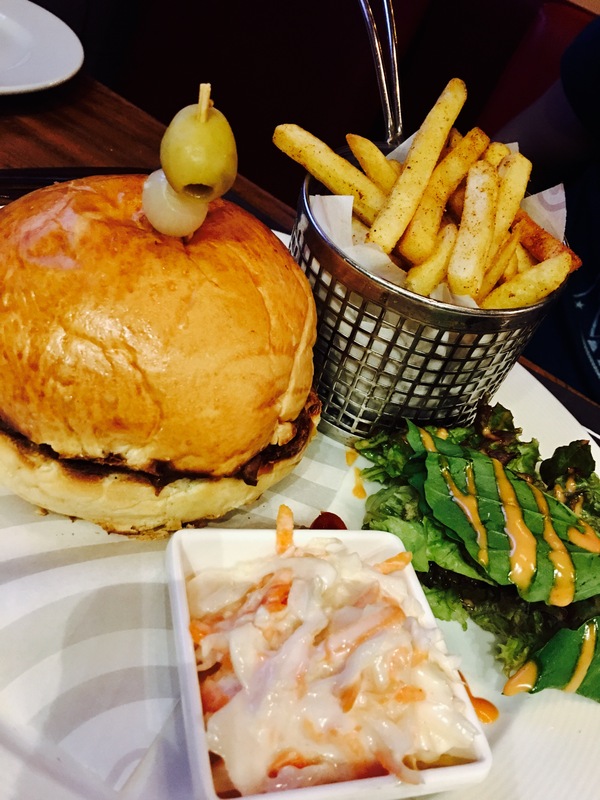 Again there was a generous portion of tender beef in a fresh bun with a tangy BBQ sauce served with crunchy fries and creamy coleslaw. Overall the food was good, solid bar food. After a couple more drinks we asked for the bill and left very happy that we’d found a new ‘local’ and of course, survived our first month in Cairo! 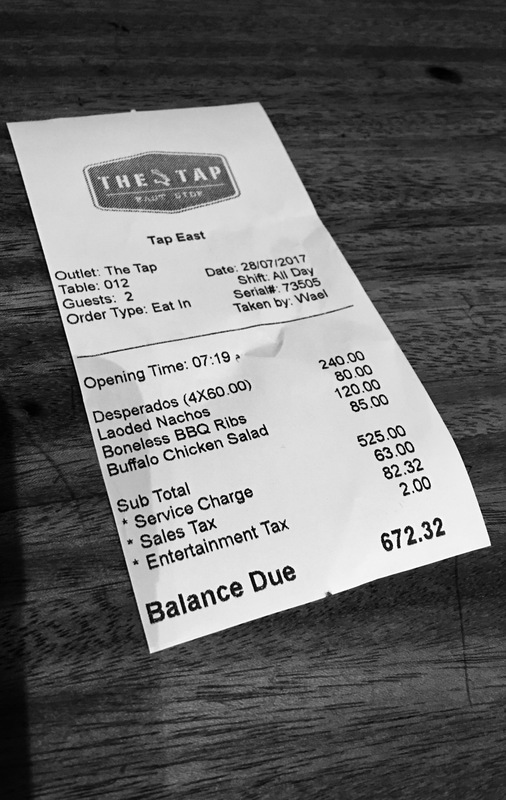 ​We paid just under 700LE in total for our food and drinks which was reasonable value. I’d like to go back again when it’s a bit busier, maybe when there’s a band on. Overall we enjoyed our night. When you’re new to a country how do you find out about good places to eat? For me I usually check out Trip Advisor, read blog posts and google reviews. Here in Egypt there’s El Menus which is similar to Zomato, a webiste I relied on a lot in Qatar. Having carried out my due diligence and read great reviews I reserved a table at The Smokery in Katameya Heights for a night out. We eventually arrived just after 5pm after a scenic detour thanks to Uber! 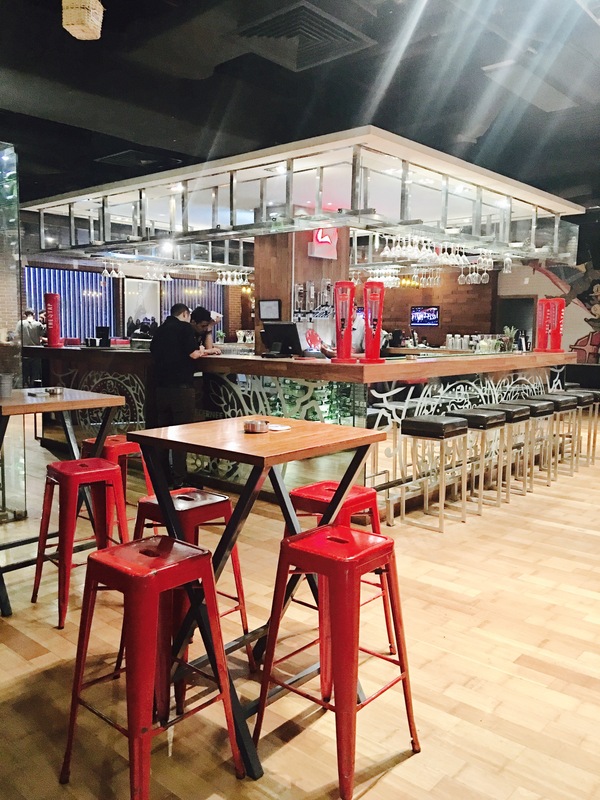 You know the feeling when you make a reservation and walk into an empty restaurant? Yeh, that’s exactly what happened. We assumed it would get busier later on and we were shown to our table by the hostess who told us we had the table ‘with the best view’. It was pretty; the weather was perfect and it was nice to sit outside overlooking the golf course and lake. We were quickly brought the menu and hopes were high it was going to be a lovely evening. 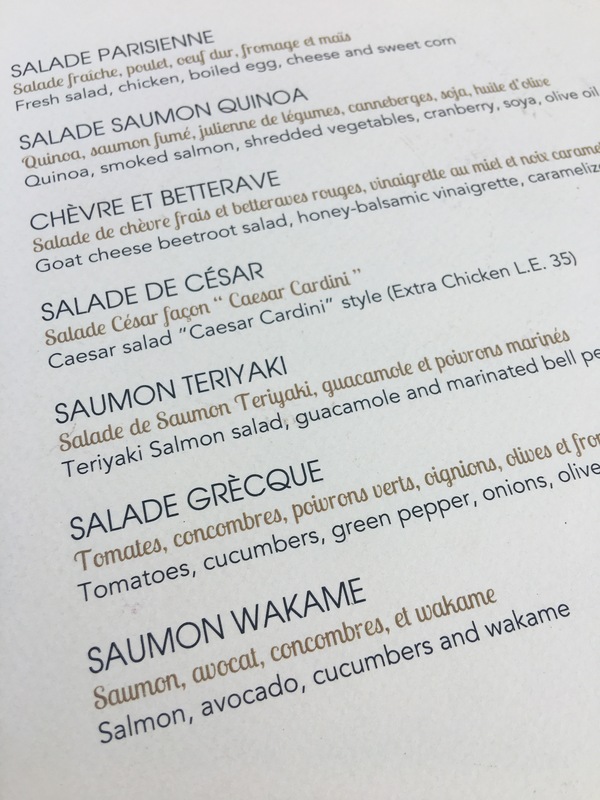 The menu written, in English and French, was extensive and the food sounded delicious. We took a while to decide what to have but the staff didn’t seem to mind as they were setting up for the evening and, as the only customers, we didn’t feel rushed at all. We decided to share a couple of appetizers and have a main course each. Our drinks were brought over but there was no interaction at all from the waiter. I know due to language barriers communication isn’t always easy, but a smile wouldn’t have gone amiss. We placed our food orders and again no interaction other than to repeat our order back to us. After waiting about 10 minutes our appetizers were placed in front of us in silence. 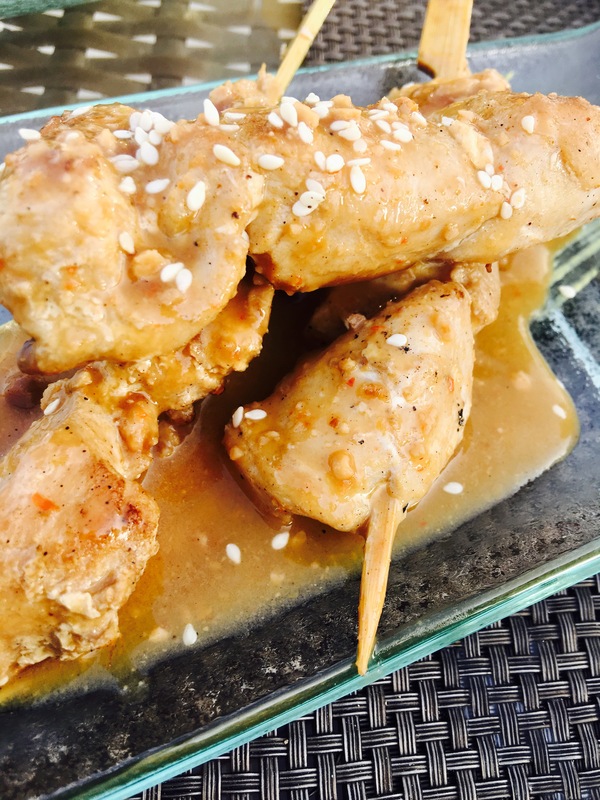 The chicken satay was ok. It was lukewarm and the sauce wasn’t particularly flavoursome, the chicken was also fairly dry. 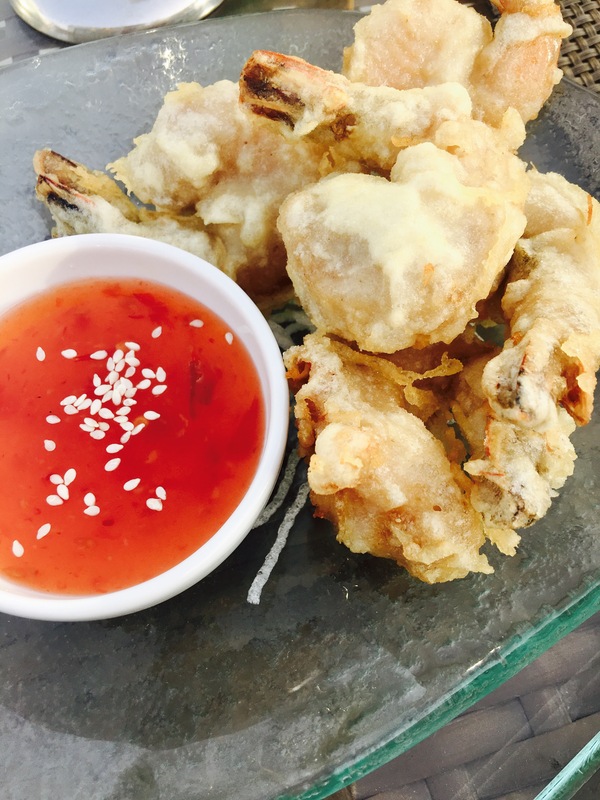 The tempura shrimp faired a little better, the plump shrimp were hot and crispy and the chili sauce packed a punch. It was just a bit ‘standard’ I think from the reviews I had higher expectations. We assured each other the mains would be better! After a suitable wait our plates were removed, again in silence, and our main courses were brought out. 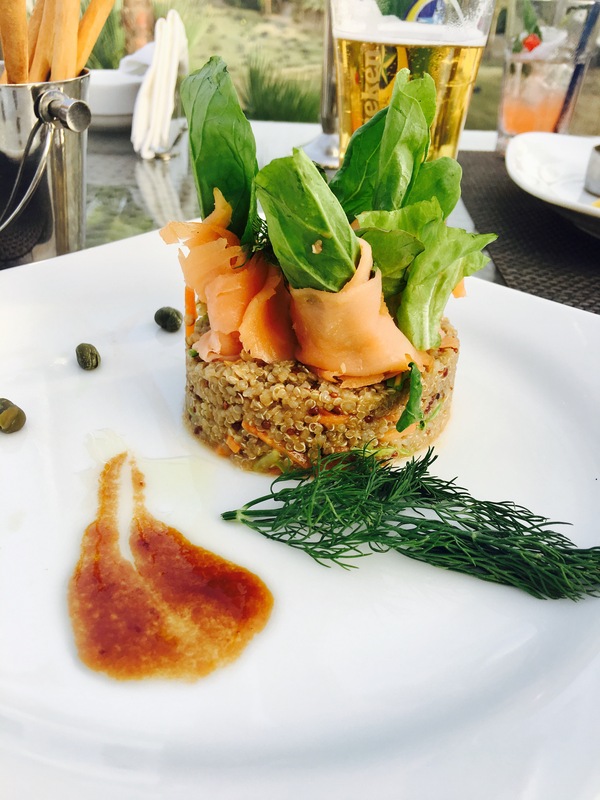 I thought my quinoa salad with salmon was well presented but unfortunately it didn’t taste as good as it looked. The quinoa had no taste and the ‘julienne vegetables’ (carrot and cucumber) didn’t add any texture. 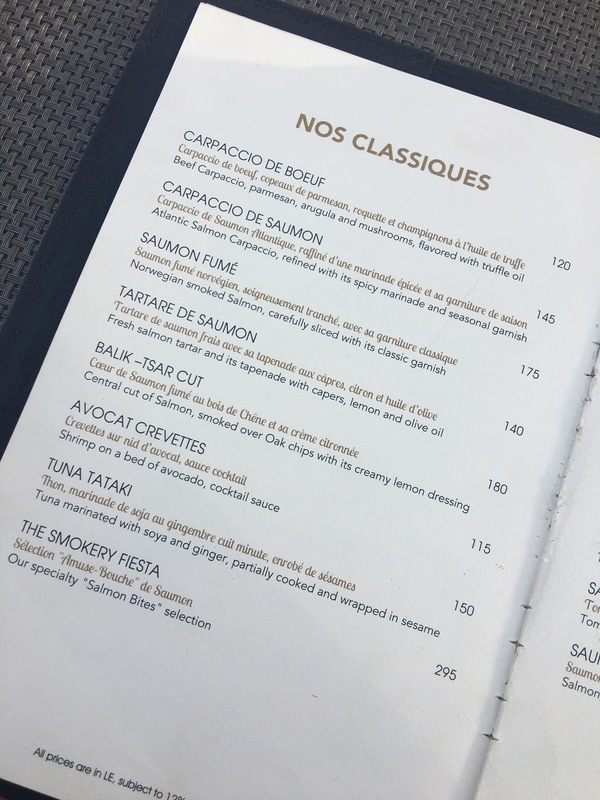 The salmon was tasty but very rich as there was nothing sharp to cut through the smokiness of the dish and it was just a bit bland and…….boring! Greg was happier with his surf n turf. 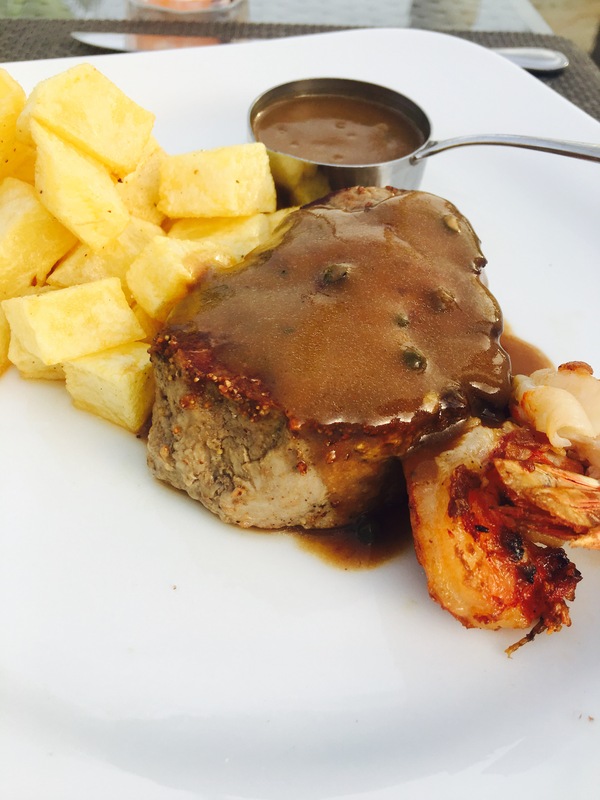 The steak was cooked medium as requested and the potatoes were well seasoned, the shrimp were really tasty. 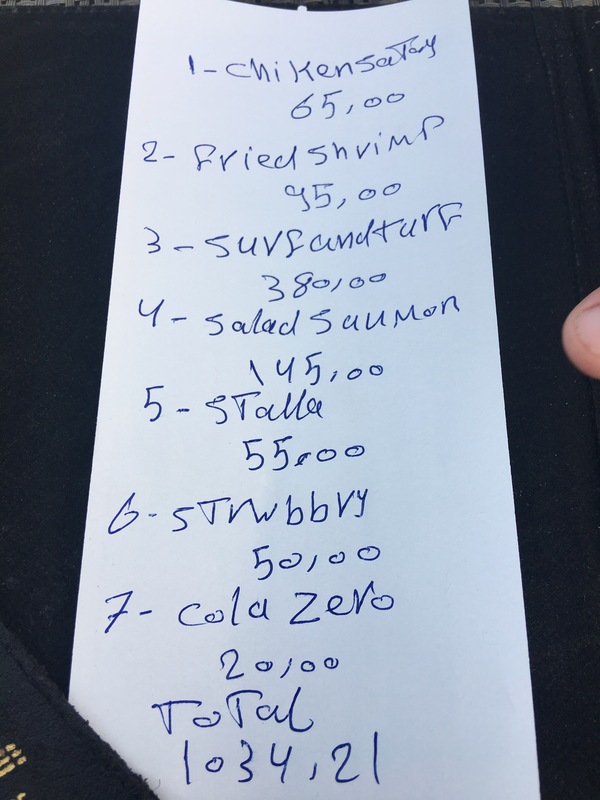 However there was a big jump in price from the steak to the surf n turf and he didn’t feel the 2 prawns were worth the extra cost. He also felt it the dish should have had some veg. Our plates were removed in silence, no enquiry if we enjoyed our meal or any smile or acknowledgment. By this point 2 more tables were occupied but there wasn’t really any atmosphere apart from the staff coming and going on golf buggys. We decided against dessert or more drinks and asked for the bill. At this point a manager came and told us there was a problem with the till and our bill was hand written. Even he didn’t ask about our meal or show any interest in our visit. We left a little over an hour after we arrived. As we left we walked past 3 members of staff and then the manager – not a single person said goodbye or even glanced at us! 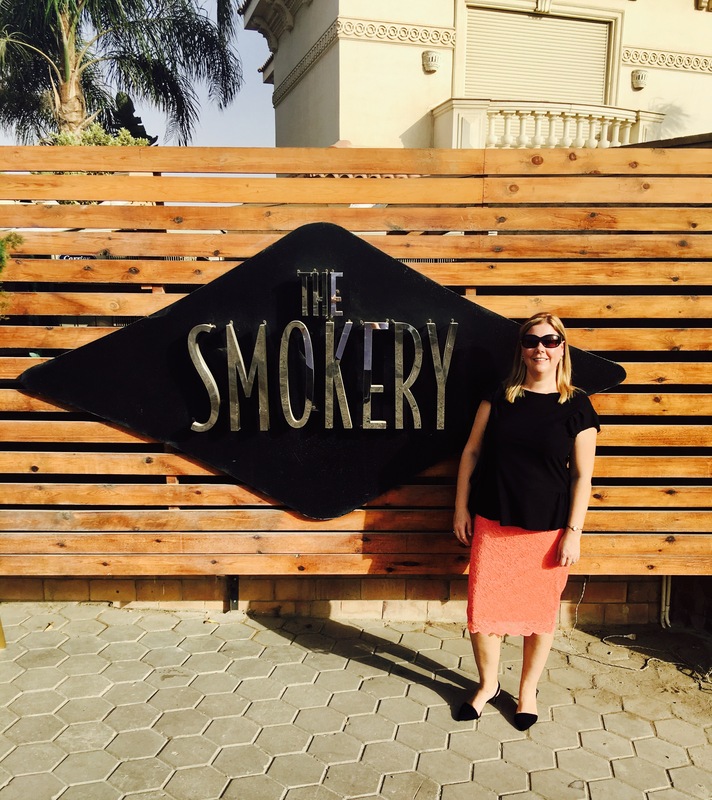 Unfortunately for us The Smokery was a bit of a disappointment. Yes, as other people had reviewed, the setting is lovely but in my opinion the food and service has got to match and for us it sadly didn’t. It wasn’t representative of the warm and friendly service we’ve experienced during our time in Cairo so far. Would I go back? I doubt we would eat there again but it is a nice spot for drink so I won’t rule out a return visit completely. The Smokery have been in touch with me, keen to find out more about my visit. It was really nice to speak to the Operations Manager and discuss some of the points I raised. He was very keen to emphasise that our experience certainly isn’t what customers should expect, we’ve been invited back for dinner. I’ll update this post again if we return. I thought it was really good of them to contact me – things don’t always go right but I feel they’re trying to make amends.